The Viking warrior would use a standard set of weapons in a fight or a battle, and these weapons were carefully chosen and used appropriately to ensure the advantage for the Vikings. Of course close quarter combat was the preferred choice with Viking warriors and their weapon choices reflected this. They favoured bladed weapons, with the ability to gore, slice and cut, possibly considered in their eyes to be the weapons most suitable to end a fight quickly, and effectively. For a Viking warrior his life would be at risk often, in battle, in wars and in raids and his comrades in these fights would be his weapons. With this spear, sword and axe they would be at one, the weapons becoming extensions of their own limbs. In this way the weapons of a Viking were essential to his survival, and for this reason they were treasured items and often revered in the old Norse societies. A Viking would often give his weapons names showing the close bond shared between a Norse warrior and his trusty sidearms. The spear was a popular weapon for Vikings, allowing them to fight effectively at range, and when faced against a sword or axe wielding opponent, gave them considerable distance advantages. With a shaft length of up to three metres or around nine feet long, the spear would be used as a pole arm or a projectile weapon. The Axe for a Viking was a multi purpose tool, a weapon and also a utility that would be used in every day life. Cheap to make and affordable for most Vikings the axe was popular in battle too. The heavy blade of the axe allowed it to easily pierce and shatter armour, shield, metal and bone effectively. Like the sword, the axe was a treasured weapon, not only because of its effectiveness in combat but its use in everyday life. It was common for Viking warriors to name their axes, and of course in burial an axe would be at its owners side. A selection of Viking weapons, including swords and axes. The sword was the primary weapon for the Viking warrior who could afford it, it was easy to wield, easy to carry in all situations and effective in combat. The primary type of Viking sword would be a doubled edged wide blade, reaching up to 80 cm, or 32 inches. There have however been many different examples of Viking swords found, with varying styles and designs. For a Viking warrior, the sword would be his pride and joy, and would almost certainly earn itself a name, and likely be buried with the warrior should he die. The Viking knife or ‘knifr’ as they called it, was a small blade that every Viking, not only warriors would carry, it would only really be used in combat as a last resort, as it was typically a utility knife, used for everyday tasks. The other Viking knife more commonly used by the Viking warriors was the ‘seax’ knife. This was a a broken back blade meaning the bladed tip angled down at the back of the blade. This knife was much bigger and more capable in battle, but still no match for a sword, axe or spear. It was common for the Vikings and ancient Norse to give their weapons pet names, or nick names. The attachment between the warrior and his weapon is an easily understandable bond. 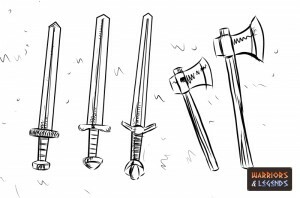 For a weapon that would have saved your life in battle many times the bond is obvious, and this is likely the reason for the naming of weapons, bestowing upon them their own personality and nature. The choice and range of weapons for the old Norse were really very particular, they often carried the same weapons in every battle, and there was little stray from this choice. The reasons for this very particular set of weapons is obvious, they worked. The battle tested combination of spear, axe and sword would serve a mighty Viking warrior well in most combat situations, and they blended well with the often ferocious fighting style employed by these warriors.